The Arian Philostorgius wrote his Church History in twelve books. A copy came into the hands of the patriarch Photius in the 9th century, bound into two volumes, and he reviewed it in his Myriobiblion or Bibliotheca, as codex 40 (online in English here). But as the Myriobiblion went on, Photius returned to some of the volumes that he had read earlier, and wrote further remarks at greater length, often amounting to an epitome of the work. He did the same for Philostorgius, although in this case the epitome did not form part of the Myriobiblion but was transmitted separately. The complete work has since been lost, probably in the disaster of 1204 when Constantinople was sacked by the renegade army originally hired for the Fourth Crusade. Here are the manuscripts in which the epitome has reached us. A more complete list can be found at Pinakes here. These details may be found at much greater length in the GCS edition by Bidez, p.xviii ff (1st edition of 1913 online here). B. Oxford, Bodleian: Codex Baroccianus 142. Paper. 13-14th century. 292 pages. Online here (use Chrome to view). This is the archetype of most of the others, and consists of a collection of texts and excerpts on the history of the church, compiled by Nicephorus Callistus as source materials for his own Church History. A list of contents may be found at Pinakes here. Philostorgius is folios 243-261. This is image 495 in the online facsimile, which starts with this. 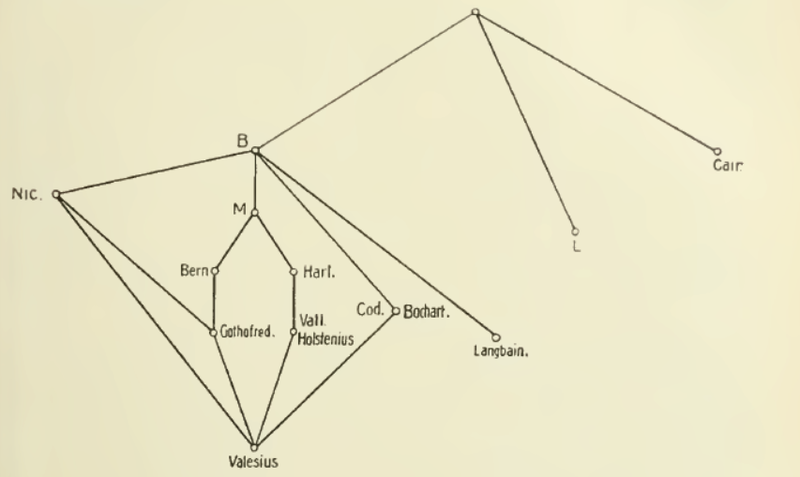 The name of Philostorgius is in the centre; that of Photius to the right. M. = Venice. Codex Marcianus gr. 337. Parchment, 15th century, from the library of Bessarion. Folios 353-370 contain Philostorgius. The title is given as ἐκ τῶν ἐκκλησιαστικῶν ἱστοριῶν φιλοστοργίου ἐπιτομὴ ἀπὸ φωνῆς φωτίου πατρίαρχου. Bern. = Bern. Codex Bernensis 54. Paper, 16th century. Once owned by Jacques Bongars. Philostorgius is fol. 1-53. Harl. = London, British Library Harleian gr. 6316. Paper. 15-16th c. Philostorgius is fol. 1-42. Vall. = Rome, Codex Vallicelliana 181 (XCI), 16th century. Item 14 within it is Philostorgius. Langbaine = Oxford, Bodleian Library, Cod. Langbaine 20, paper, quarto size, unknown date. Langbaine died in 1658. Philostorgius is on pages 255-493. L. = Florence, Mediceo-Laurenziana Plutei 70, 5. Paper, 15th century. Fol. 63 contains two excerpts from Philostorgius. Cairo = Cairo, Library of the Patriarch 86 (formerly 1002), paper, 13th century. Oxford, Codex Barocci 67, 15th century. Fol. 1-147. Online catalogue. But the digitised volume seems to be the second half, which is not Philostorgius. Vatican, Codex Palatinus Graecus 4, 10th-11th century (!). Folios 151v-189v. This is not as yet online. Useful to know all this. A text gains reality when we see on what it is based.